Air Combat Command will combine this summer its 24th and 25th air forces to integrate cyber, electronic warfare, information operations and intelligence, surveillance and reconnaissance activities at Joint Base San Antonio-Lackland in Texas, the Air Force reported Thursday. “The merger of 24th and 25th is the next step in leveraging and integrating new ideas and technologies to both improve the quality and speed of decision-making and deliver improved effects for commanders,” said Gen. Mike Holmes, commander of Air Combat Command. Applied Insight announced on Thursday that it is moving its headquarters from Ashburn, Va. to Tysons Corner, Va. and made changes to strengthen its leadership team. Mehdi Cherqaoui will serve as chief financial officer in a company that focuses on analytics, cloud and mission IT for federal government clients. 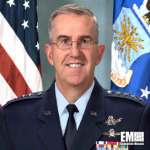 Gen. Robert Brown, U.S. Army Pacific’s commanding general, said during the Association of the U.S. Army Global Force Symposium in Huntsville, Ala., that the service must prepare for multidimensional combat, National Defense magazine reported Wednseday. Brown noted that all Army units will eventually cover capabilities to handle threats such as electronic warfare, drone swarms and unmanned aerial vehicles. Gen. Paul Nakasone, commander of U.S. Cyber Command and director of the National Security Agency, said the Pentagon is benefiting from a faster hiring process for cyber employees following the launch of a new personnel system, Federal News Network reported Tuesday. Homeland Security Secretary Kirstjen Nielsen said the federal government should increase efforts to protect agencies, industry, academia and the public from hackers supported by other countries since the U.S. today “is not prepared” for a foreign cyber attack, The Hill reported Monday. “It’s not just U.S. troops and government agents on the frontlines anymore. It’s U.S. companies. It’s our schools and gathering places. It’s ordinary Americans,” Nielsen said during a speech at the George Washington University.